Wader Quest: Masked and Black-shouldered Lapwings. and Black-shouldered Lapwing Vanellus novaehollandiae. 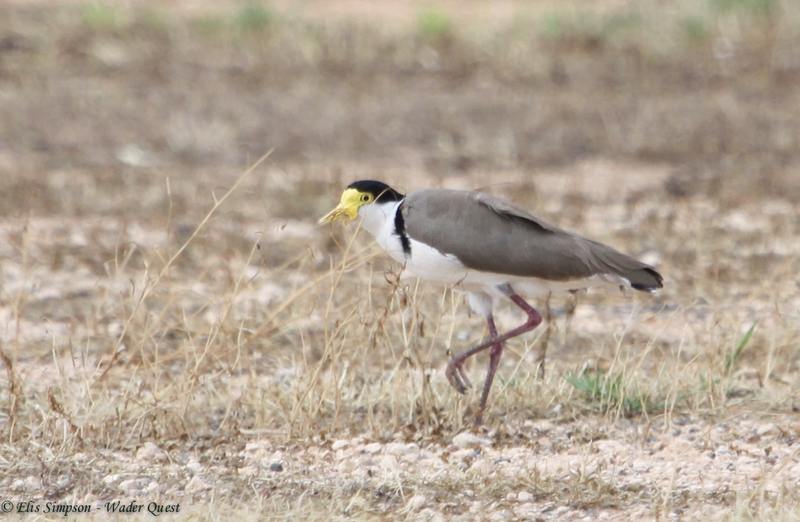 ... whereas on the Black-shouldered Lapwing they are restricted to in front and below the eye and across the forehead. 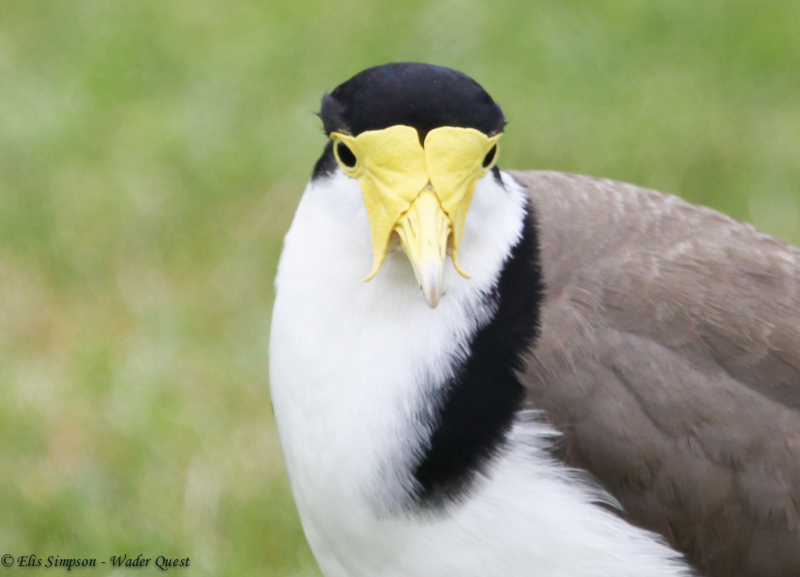 In addition the lappets on the Masked lapwing are longer, more exaggerated and more pointed at the tip. 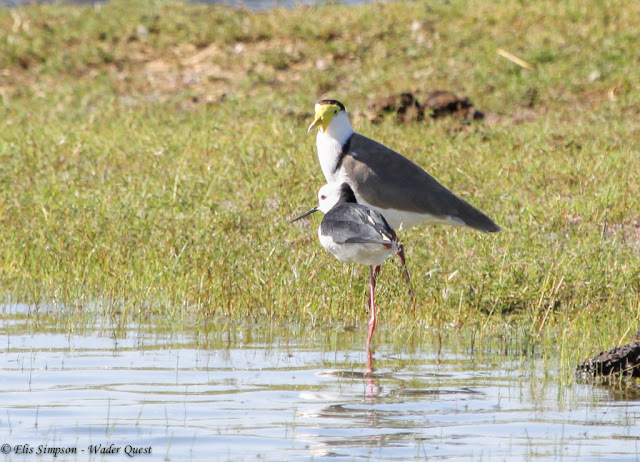 The Black-shouldered Lapwing gets its common name from the dark shoulder bar that extends across the back and is connected to the black cap which in Masked Lapwing does not extend down into the nape leaving a white collar. 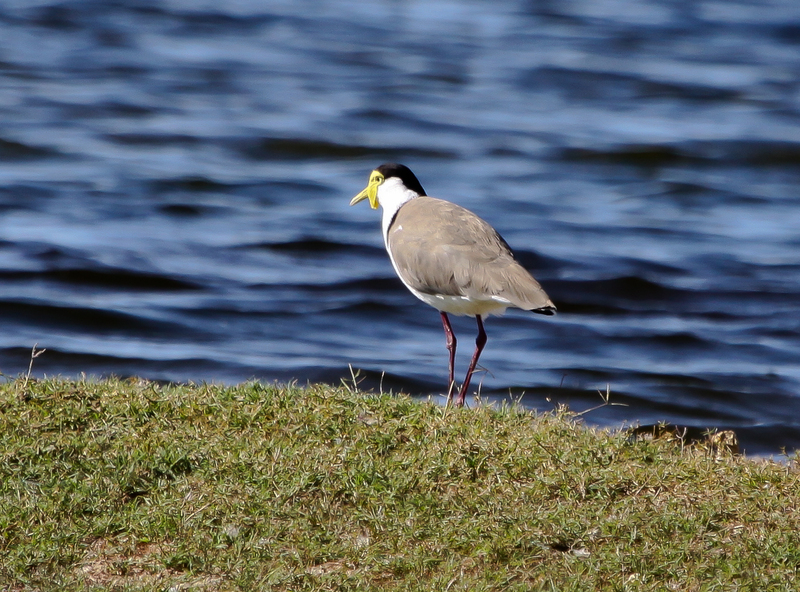 Otherwise the two birds are very similar. They certainly both have a fearsome reputation and are known to terrorise neighbourhoods when they are nesting causing school children to select alternative routes to school rather than run the gauntlet of passing through a Lapwing territory. The two birds live in different areas. 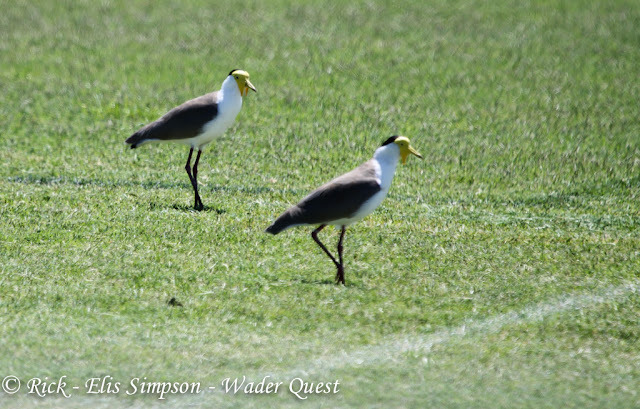 The Masked Lapwing extends from New Guinea into northern Australia from northern Queensland west to northern Western Australia with a cone of residence extending in the centre of that range south to central South Australia. 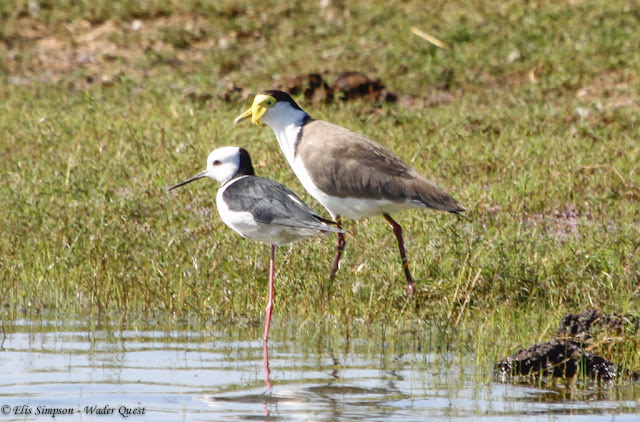 The Black-shouldered Lapwing resides in an area east of an arc from the coast in central South Australia to the coast on northern Queensland and also in New Zealand. 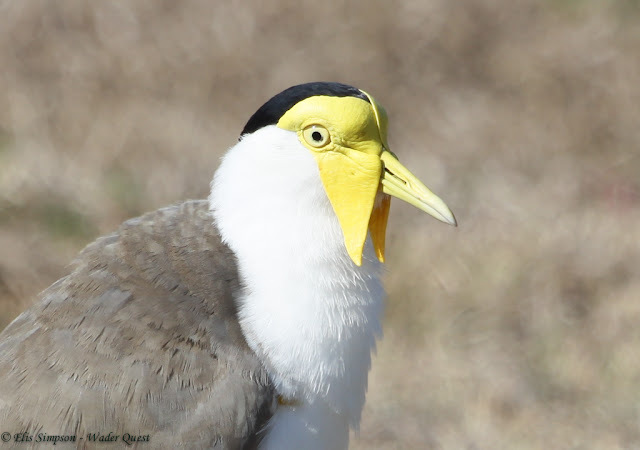 There is some degree of overlap where hybrid forms can be found. The Black-shouldered Lapwing's colonisation and spread in New Zealand has been rapid. 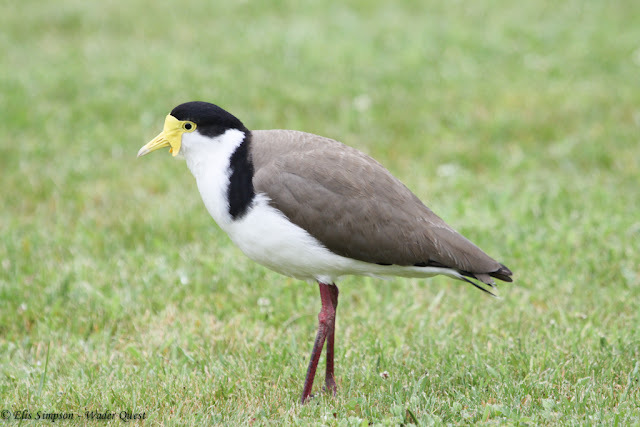 It self colonised as recently as 1932 and has since spread across both the South Island and North Island and has even reached the Chatham Island in the 1980s. When we were visiting Broome in Western Australia approaching the westernmost extremity of Masked Lapwing's range, we came across an unusual bird given that the closest part of the Black-shouldered Lapwing's range was over a thousand miles to the east. 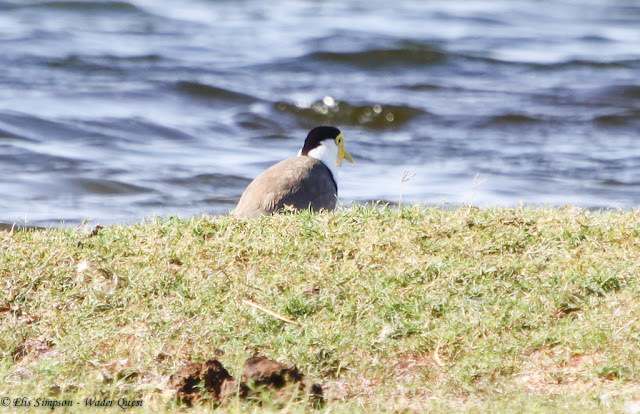 At first this appeared to be a displaced Black-shouldered Lapwing but after some scrutiny we thought that perhaps it was an intergrade between the two forms. 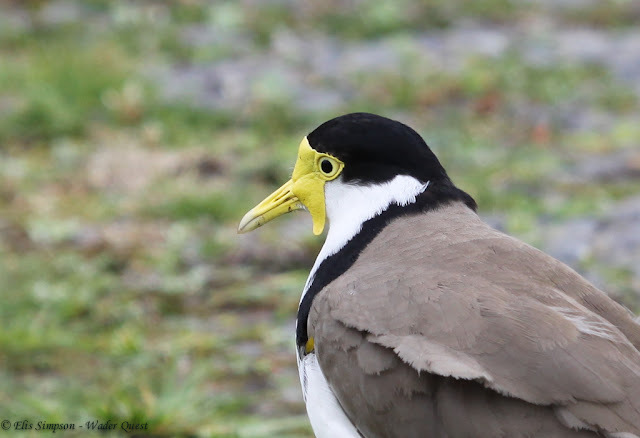 The wattle above the eye looked more substantial than would be normal for a Black-shouldered and yet was not extensive enough to be that of a Masked Lapwing, the lappet perhaps was also a little full, long and pointed for that species. It certainly had the black shoulder marks and they appeared to meet the cap on the nape so we may well have been looking at a hybrid. Extensive black on the nape. Black cap attached to black collar.